I often express my desire to create a lasting record of my achievements, ambitions, and life goals. I have always been very ambitious and wanted to have a successful company since I was ten years old. 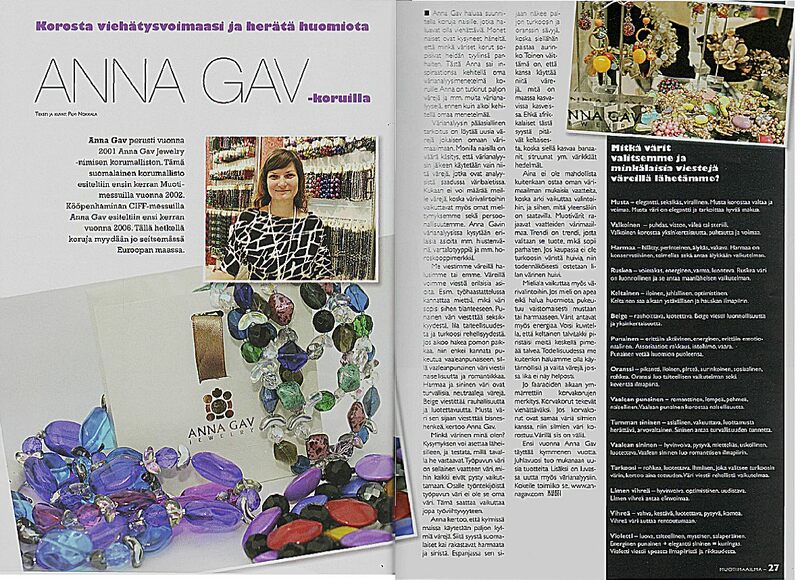 In 2001, I established a fashion company that designs, manufactures and distributes fashion jewelry under the registered EU trademark of ANNA GAV Jewelry in Helsinki, Finland. The company’s success is due to its popular and unique collections of luxury, high-end fashion jewelry. The jewelry designs are color tailored to fit any apparel style. More than 205 000 customers have purchased ANNA GAV jewelry. More than 200 fashion industry retailers distribute ANNA GAV jewelry in Europe: department stores, chain stores, fashion stores and boutiques in many different countries. More than 300 unique design patterns are copyrighted. More than 500 publications appeared in magazines, newspapers, TV shows, movies, theaters, and other mass media. After many years of experience and hard work in the fashion industry, I believe in the power of thought. “Bucket list for the future” – my Art encryption is always working for me to achieve my goals and aspirations. Experience Marvelous and Innovative Methods to Create Own Artwork for Your “BUCKET LIST FOR THE FUTURE” in Collaboration with Anna Gav.